PSi refractometric sensing applications have generally been size limited to molecules that diffuse into the porous matrix to cause a measurable change in effective optical thickness. Molecules approaching the average pore diameter clog the pore and hinder molecular infiltration, which significantly deteriorates the transduced signal. Hence there is a significant challenge in detecting biological entities such as viruses, bacteria, and blood cells that typically have sizes much larger than those of the pores. The PSi BSW/BSSW biosensor offers the possibility to detect both small molecules that infiltrate the pores and large molecules attached to the sensor’s surface. The BSW mode is a surface state excited within the truncated defect layer at the surface of a multilayer Bragg mirror. The novel BSSW mode is confined by a step or gradient refractive index within the multilayer and can selectively detect small molecules attached within the pores with an enhanced sensitivity (>2000 nm/RIU). The BSW and BSSW modes are each manifested as a distinct resonance peak in the reflectance spectrum, and the angular shift of each peak resulting from the light-matter interaction can be used to quantify the number of molecules attached to the sensor. a) BSW/BSSW graphic with superimposed electric field profiles or a BSW (red), BSSW (blue), and band edge (purple) mode. b) Dispersion relation of a step index BSW/BSSW structure. The BSW appears within the band gap due to the surface defect state. The BSSW is introduced by the creation of a step refractive index profile. c) Schematic illustrating the location of large surface bound molecules and small molecules that can infiltrate the pores. The simple integration of a ring resonator into PSi allows for high sensitivity, high quality factor sensing applications that can be further assimilated with multiplexed microfluidics to create lab-on-a-chip technology. However, the majority of the electric field confined within the ring reduces the maximum detection sensitivity due to the small overlap between the optical mode and surface-bound molecules. 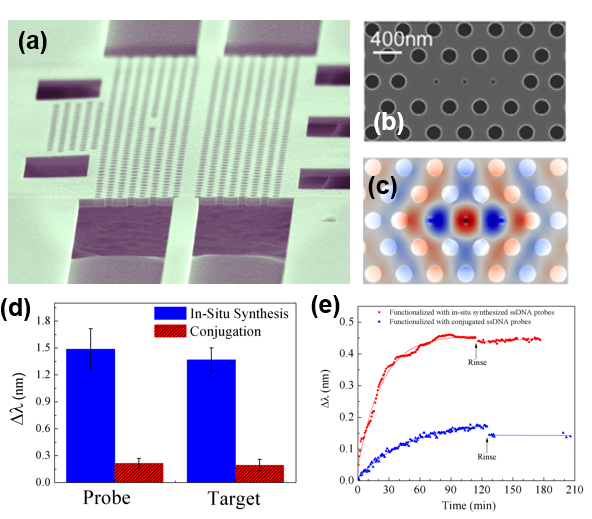 In order to improve the capabilities of optical microring resonator biosensors, we fabricate microring resonators on a porous silicon (PSi) platform using the same fabrication techniques as used with traditional silicon-on-insulator (SOI) ring resonators. The simple integration allows for direct light-matter interaction of the analyte and optical mode leading to an enhanced sensitivity. The refractive index change caused by the molecules inside the pore are manifested as a shift of the spectral resonances. This molecular detection sensitivity is one order of magnitude greater than that reported for nucleic acid detection using SOI rings. a) Top view of a ring resonator etched into a porous silicon waveguide. b) Spectral red shifts of the PSi ring resonances caused by the specific binding of a probe DNA to a small linker molecule, SPDP, and the hybridization of the probe DNA to its target PNA sequence. Microfluidic systems are often integrated with sensors to facilitate real-time molecular detection. In a typical microfluidics system, the sample solution flows over the active binding surface of a sensor in a micro-channel. For sensors based on nanoporous materials, the flux into an individual pore can be as slow as a few molecules per pore per second due to the high aspect ratio of the nanopores. As a result, most molecules are swept downstream in the channel without reacting with the porous sensing surface. In this work, we present for the first time a label-free, flow-through sensing platform based on open-ended PSi microcavity membranes that is compatible with integration in on-chip sensor arrays. This flow-through platform, allowing analyte solutions to pass through the pores, greatly improves analyte transport efficiency, especially for larger molecules, and reduces sensor response time. Schematic representation of flow-over (left) and flow-through (right) porous silicon membrane structures. This work utilizes the high QY of colloidal QDs along with their high refractive index to engineer a novel, dual-mode optical detection scheme for small molecules in a tunable nanostructured porous matrix that offers the advantages of inherent size selectivity and extremely high active surface areas. We show, for the first time, quantum dot (QD) labeled sensing in a porous silicon host material with a sensitivity that is among the best reported in the literature under standard laboratory conditions. The work meticulously addresses the major challenges that come with using a three-dimensional nanostructured porous matrix for the selective capture of small molecules such as total surface area characterization and influence of pore size on target molecule infiltration. Beyond the material characterization and functionalization, the specific, dual-mode detection of biotin-QD conjugates in the porous silicon host matrix by reflective interferometric spectroscopy and fluorescence measurements is demonstrated. This approach combines the benefits of fluorescence based detection schemes via QD bioconjugation, including signal stability and high signal to noise ratio, with optical reflectance signal amplification achieved via the QD-enhanced refractive index change in the high surface area-to-volume porous silicon host matrix. Over a three order of magnitude improvement in the detection limit of biotin molecules is reported (from 2 pg/mm2 to 0.5 fg/mm2) when the QD labels are employed. These results demonstrate the opportunities offered by the utilization of QD-labeled sensing in a nanostructured three-dimensional matrix to efficiently capture target molecules. a) Schematic representation of surface functionalized PSi film before and after attachment of QDs. Light reflecting off the top and bottom interfaces of the fi lm interfere and produce characteristic Fabry-Perot fringes. b) Reflectance fringe shifts and c) increase in EOT for an oxidized ~ 5.5 um thick PSi layer with 20 nm average pore diameter after APTES surface functionalization and immobilizing 2.8 nm PbS QDs. 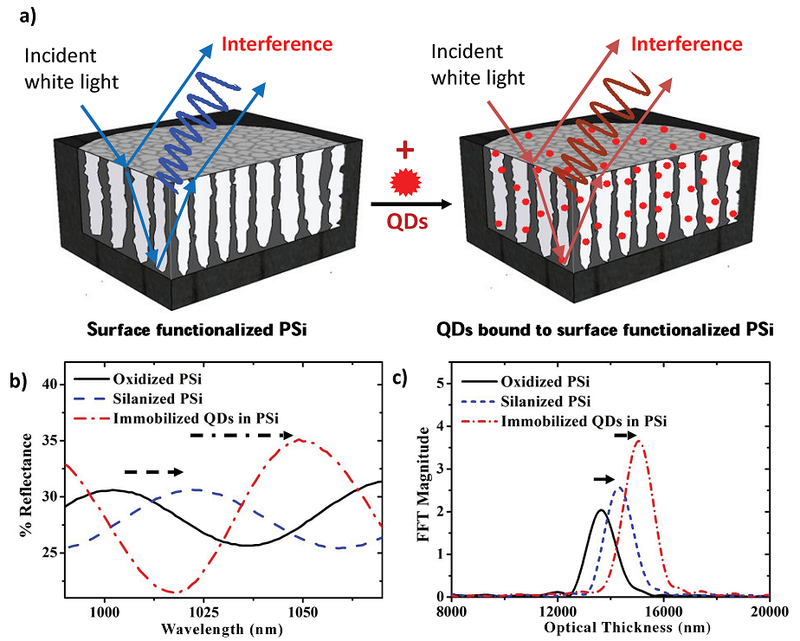 The increase in spectral shift and FFT amplitude demonstrate that QDs are being covalently bound to the functionalized pore walls. a) Fluorescence spectra of QD-biotin conjugates in solution and bound inside a streptavidin-functionalized PSi film. The fluorescence of the conjugates inside the PSi film is modulated due to thin film interference effects and demonstrates that the conjugates are inside as opposed to only on top of the PSi film. Reflectance spectra for the detection of biotin b) with and c) without the use of QD-conjugates from two different PSi samples functionalized with streptavidin probes. Use of the QDs conjugated to biotin molecules significantly amplifies the sensor response. Photonic crystals, periodically patterned dielectric materials, have found many uses in optical waveguiding, switching, and sensing applications, among others. Useful properties of photonic crystals include the ability to engineer photonic bandgaps at specified frequencies/wavelengths, as well as the high field confinement in defect structures. In this research project, these properties are combined with effective index materials created by sub-wavelength holes fabricated inside PhC. In order to achieve rapid, ultralow detection limits with microliter sample volumes, it is imperative to achieve a high surface density coverage of probe molecules that maximizes target capture with minimum incubation times. Without a sufficiently high probe molecule density, signal amplification, for example, through the use of a sandwich assay, must be implemented. We report on in situ, base-by-base synthesis of single-stranded DNA (ssDNA) probe molecules directly onto silicon photonic sensor surfaces, resulting in over 5-fold increased ssDNA probe surface coverage and a more than 5-fold increased detection sensitivity compared to sensors functionalized with traditional ssDNA probe attachment methods. (a) SEM image of MHD photonic crystal device with a lattice hole radius of 100 nm and a lattice constant a of 410 nm. (b) Zoom-in SEM image of MHD cavity showing the defect holes, ∼ 50 nm in diameter, and neighboring right and left lattice holes that are shifted 0.15a outward to achieve lower mode profile perturbation at the cavity edge. (c) Simulated electric field distribution (TE mode) for the MHD cavity showing strong field confinement in the defect hole region due to a slot waveguide-like effect. (d) Average resonance wavelength shifts for probe and target binding on three MHD photonic crystals functionalized by the in situ ssDNA probe synthesis method and three MHD photonic crystals functionalized by the traditional ssDNA probe conjugation technique. (e) Kinetic binding curves for ssPNA target sequences using microfluidic channels as an analyte delivery system to 5 µm radius silicon ring resonators functionalized with either in situ synthesized or directly conjugated ssDNA probe molecules. The solid lines connecting data points taken before the rinse step indicate exponential fits of the kinetic binding rates of ssPNA for the two different rings. The faster response time of the ring functionalized with in situ synthesized probes is proportional to the increased probe surface coverage on that ring. In order to further improve the sensitivity of optical sensors, it is necessary to increase the field overlap with captured target analytes. In this work, we characterize the sensing performance of suspended TM-mode silicon micro-ring resonators, 5 µm in radius, and demonstrate an enhanced sensitivity to molecular binding on the ring after suspension. In the TM-mode, the overall field intensity exists primarily outside of the waveguide core, with high electric field intensities present near the top and bottom surfaces. In traditional micro-ring resonators, only the top surface of the ring is available for surface analyte attachment, while the electric field intensity near the bottom surface dissipates by leaking into the underlying silicon dioxide substrate. In our approach, we suspend the TM-micro ring resonators in order to increase the surface area for binding events and increase the light-matter interaction with analytes. The suspended rings demonstrate excellent mechanical stability to multiple rinsing, soaking and nitrogen drying steps during the sensing procedure. We show that the resonance shift achieved by the suspended micro-rings after attachment of small chemical molecules and DNA is at least twice that of micro-rings supported by the silicon dioxide substrate. (a-e) Scanning electron microscope images of a fabricated device. (d) Top view of a supporting truss. The width of truss is approximately 100 nm. (e) Tilted image of the supporting truss with a height of approximately 260 nm. The aspect ratio of 2.6 allows good mechanical support for the suspended ring structure. (f) Optical spectrum measurement after suspension process. The Q factor of 5 µm radius TM ring resonator is 15,000. 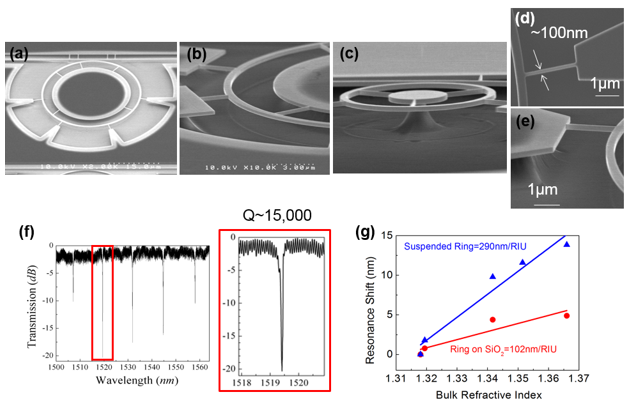 (g) Bulk refractive index sensitivity of suspended ring resonator compared with traditional ring resonator on SiO2. The colored lines are linear fits to the data.